The Department of Health and Human Services’ Office for Civil Rights has announced its fourth largest HIPAA violation penalty has been issued to The University of Texas MD Anderson Cancer Center (MD Anderson). MD Anderson has been ordered to pay $4,348,000 in civil monetary penalties to resolve the HIPAA violations related to three data breaches experienced in 2012 and 2013. MD Anderson is an academic institution and a cancer treatment and research center based at the Texas Medical Center in Houston, TX. Following the submission of three breach reports in 2012 and 2013, OCR launched an investigation to determine whether the breaches were caused as a result of MD Anderson having failed to comply with HIPAA Rules. The breaches in question were the theft of an unencrypted laptop computer from the home of an MD Anderson employee and the loss of two unencrypted USB thumb drives, each of which contained the electronic protected health information (ePHI) of its patients. In total, the PHI of 34,883 patients was exposed and could potentially have been viewed by unauthorized individuals. The investigation revealed that MD Anderson had conducted a risk analysis, as is required by HIPAA. That risk analysis revealed the use of unencrypted devices posed a serious threat to the confidentiality, integrity, and availability of ePHI. To address the risk, in 2006 MD Anderson developed policies that required all portable storage devices to be encrypted. However, even though policies called for the use of encryption, encryption was not implemented until March 24, 2011. When encryption was implemented, it was not implemented on all portable devices in its inventory. MD Anderson reported to OCR that by January 25, 2013, it had only encrypted 98% of its computers. If MD Anderson had implemented encryption on all portable electronic devices containing ePHI, the three breaches would have been prevented. The laptop was stolen from the home of Dr. Randall Millikan on April 30, 2012. Dr. Millikan confirmed that the ePHI on the device were not encrypted, the laptop was not password protected, and the ePHI could potentially have been viewed by family members at his home as a result, as well as by the individual who stole the laptop. The USB devices were lost on or around July 12, 2012 and December 2, 2013. The first contained an Excel file containing the ePHI of 2,264 individuals. The device was lost by a summer intern on her way home from work. The second USB drive was lost by a visiting researcher from Brazil at some point over the Thanksgiving weekend. The device was usually left in the tray on her desk. Neither device was encrypted or password protected. Between 2010 and 2011, MD Anderson’s Information Security Program and Annual Reports stated clearly that the storage of ePHI on mobile media was a key risk area that had not yet been mitigated, which was also detailed in its risk analysis for fiscal year 2011. That risk analysis determined that employees were downloading ePHI onto portable storage devices for use outside the institution. The failure to address the risk was a violation of 45 C.F.R. § 164.312(a)(2)(iv) and its own policies. When financial penalties are deemed appropriate, OCR usually negotiates with the covered entity and a settlement is agreed; however, MD Anderson disagreed with OCR’s decision and maintained the financial penalty was unreasonable. Specifically, MD Anderson claimed that it was not obligated to use encryption as the data on the devices were used for research purposes, and that the research was not subject to HIPAA’s nondisclosure requirements. 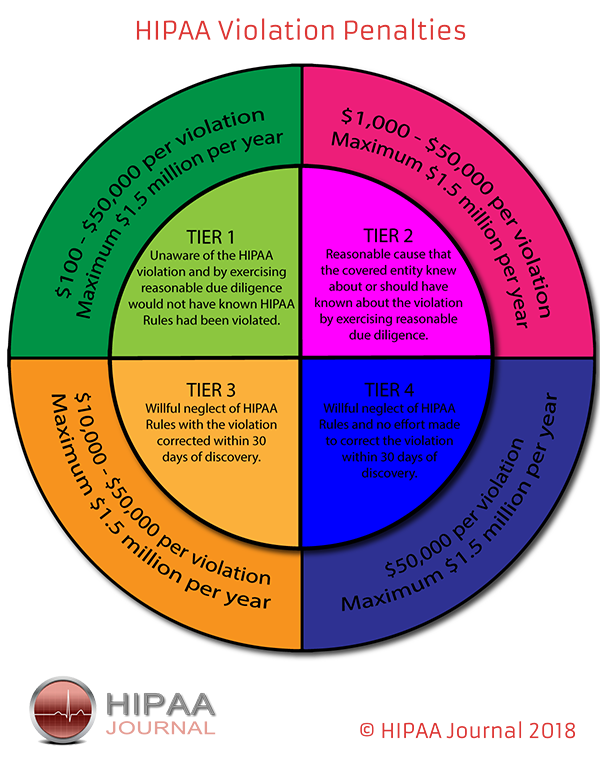 A covered entity has the right to contest penalties for HIPAA violations. Consequently, the matter was referred to an Administrative Law Judge. The penalty amounts in such cases are a minimum of $1,000 for each violation up to a maximum of $1.5 million per calendar year. OCR determined penalties were appropriate for calendar year 2011 (283 days from March 24 to December 31), calendar year 2012 (366 days from January 1 to December 31) and calendar year 2013 (25 days from January 1 to January 25), and applied the maximum penalty of $1.5 million for each of those calendar years. Administrative Law Judge Steven T. Kessell granted summary judgement in favor of OCR to remedy MD Anderson’s noncompliance with 45 C.F.R. § 164.312(a) – Technical Safeguards; encryption – and 45 C.F.R. § 164.502(a) – Uses and Disclosure of PHI; impermissible disclosure of ePHI. The post OCR Announces $4.3 Million Civil Monetary Penalty for University of Texas MD Anderson Cancer Center appeared first on HIPAA Journal. The HIPAA Conduit Exception Rule is a source of confusion for many HIPAA covered entities, but it is essential that this aspect of HIPAA is understood. Failure to correctly classify a service provider as a conduit or a business associate could see HIPAA Rules violated and a significant financial penalty issued for noncompliance. On January 25, 2013, the HIPAA Omnibus Final Rule was issued. The HIPAA Omnibus Final Rule introduced a swathe of updates to HIPAA Rules, including the incorporation of the Health Information Technology for Economic and Clinical Health (HITECH) Act. HIPAA Omnibus Final Rule included an update to the definition of a business associate. Prior to January 25, 2013, a business associate was a person or entity that creates, receives, or transmits protected health information (PHI) on behalf of a covered entity. The Omnibus rule added ‘maintains’ to that definition. That meant companies that store electronic information – or physical records – are considered business associates. The Omnibus Rule also confirmed that most data transmission service providers are also classed as business associates. The HIPAA Conduit Exception Rule is detailed in the HIPAA Privacy Rule, but was defined in the HIPAA Omnibus Final Rule. The Rule allows HIPAA-covered entities to use certain vendors without having to enter into a business associate agreement. The HIPAA Conduit Exception Rule is narrow and excludes an extremely limited group of entities from having to enter into business associate agreements with covered entities. The Rule applies to entities that transmit PHI but do not have access to the transmitted information and do not store copies of data. They simply act as conduits through which PHI flows. HIPAA Conduit Exception Rule covers organizations such as the US Postal Service and certain other private couriers such as Fed-Ex, UPS, and DHL as well as their electronic equivalents. Companies that simply provide data transmission services, such as internet Service Providers (ISPs), are considered conduits. The HIPAA Conduit Exception Rule is limited to transmission-only services for PHI. If PHI is stored by a conduit, the storage must be transient in nature, and not persistent. It does not matter if the service provider says they do not access transmitted information. To be considered a conduit, the service provider must not have access to PHI, must only store transmitted information temporarily, and should not have a key to unlock encrypted data. Vendors that are often misclassified as conduits are email service providers, fax service providers, cloud service providers, and SMS and messaging service providers. These service providers are NOT considered conduits and all must enter into a business associate agreement with a covered entity prior to the service being used in conjunction with any PHI. Some service providers claim that they are conduits when they are not, in order to avoid having to sign a business associate agreement. Certain fax service providers have claimed they are conduits, and while they appear at face value to be an electronic equivalent to an organization such as the US Postal Service, they are not covered by the HIPAA Conduit Exception Rule. Fax services do not simply send documents from the sender to the recipient. Faxes are stored, and the storage is not considered transient. Any vendor that has routine access to PHI is considered a business associate (We have covered the definition of a HIPAA business associate on this page). All business associates must sign a business associate agreement with the HIPAA-covered entity before PHI is provided or access to PHI is granted. Misclassifying a vendor as a conduit rather than a business associate can result in a significant financial penalty, since PHI will have been disclosed without first entering into a business associate agreement. The Department of Health and Human Services’ Office for Civil Rights has financially penalized many covered entities that have been discovered to have disclosed PHI to a vendor without obtaining a BAA. In 2017, the Center for Children’s Digestive Health settled with OCR for $31,000 to resolve business associate agreement failures. In 2016, Care New England Health System settled its HIPAA violation case for $400,000, North Memorial Health Care of Minnesota paid $1,550,000 and Oregon Health & Science University settled for $2,700,000. The post The HIPAA Conduit Exception Rule and Transmission of PHI appeared first on HIPAA Journal. The post HHS Sued by CIOX Health Over Unlawful HIPAA Regulations appeared first on HIPAA Journal. The Office of the National Coordinator for Health IT (ONC) has a new chief privacy officer – Kathryn Marchesini, JD. The appointment was announced this week by National Coordinator Donald Rucker, M.D. Marchesini will replace Acting Chief Privacy Officer Deven McGraw, who left the position this fall. The HITECH Act requires a Chief Privacy Officer to be appointed by the ONC. The CPO is required to advise the National Coordinator on privacy, security, and data stewardship of electronic health information and to coordinate with other federal agencies. Following the departure of McGraw, it was unclear whether the position of CPO would be filled at the ONC. The ONC has had major cuts to its budget, and in an effort to become a much leaner organization, funding for the Office of the Chief Privacy Officer was due to be withdrawn in 2018. However, the decision has been taken to appoint a successor to McGraw. There are few individuals better qualified to take on the role of CPO. Katheryn Marchesini has extensive experience in the field of data privacy and security, having spent seven years at the Department of Health and Human Services. During her time at the HHS Marchesini assisted with the creation of new federal policies, guidance for HIPAA covered entities on privacy and security, and many HHS health IT privacy initiatives. Most recently, Marchesini served as senior health information technology and privacy advisor at the HHS’ Office for Civil Rights and as senior advisor on privacy and precision medicine at the ONC. Marchesini also served as Division Director for Privacy at the ONC between 2014 and 2016, Acting Chief Privacy Officer at the ONC for four months in 2014, and Senior Policy Analyst and Privacy Team Leader at the ONC between October 2012 and June 2014. Prior to joining the HHS, Marchesini worked as a legal associate with two law firms, as a management analyst at Deloitte Consulting, and economics assistant at FERC. Announcing the appointment, Donald Rucker said, “[Marhesini] brings to her new roles a wealth of experience as a Senior Advisor and Deputy Director for Privacy at ONC where she advised staff and stakeholders about privacy and security implications surrounding electronic health information, technology, and health research.” The appointment has also been welcomed by Deven McGraw. The post Kathryn Marchesini Appointed Chief Privacy Officer at ONC appeared first on HIPAA Journal. The post 2017 HIPAA Enforcement Summary appeared first on HIPAA Journal. A new bill (H.R. 4613) has been introduced to the U.S House of Representatives by Congresswoman Cathy McMorris Rodgers (R-Washington) that proposes changes to the Health Information Technology for Economic and Clinical Health (HITECH) Act and HIPAA Rules for healthcare clearinghouses. The Ensuring Patient Access to Healthcare Records Act of 2017 is intended to modernize the role of healthcare clearinghouses in healthcare, promote access to and the leveraging of health information, and enhance treatment, quality improvement, research, public health and other functions. Healthcare clearinghouses are entities that transform data from one format to another, converting non-standard data to standard data elements or vice versa. Healthcare clearinghouses are considered HIPAA-covered entities, although in some cases they can be business associates. The bill – Ensuring Patient Access to Healthcare Records Act of 2017 – would see all healthcare clearinghouses treated as covered entities. Healthcare clearinghouses gather health data from a wide range of sources, therefore they could hold a complete set of records for each patient. If patients are allowed to obtain copies of their health records from healthcare clearinghouses, it could make it easier for patients treated by multiple providers to obtain a full set of their health records. While the bill could improve data access for patients, it has been suggested that patients are unlikely to benefit. Healthcare clearinghouses may have longitudinal health records from multiple sources, but in many cases, they only have claims data rather than a full set of clinical data. Even if patients could be provided with copies, it may not prove to be particularly useful. Patients can choose which healthcare providers they use, but since a healthcare clearinghouse is not chosen by patients, they are unlikely to know which healthcare clearinghouses actually hold their data. Patients rarely have any dealings with healthcare clearinghouses. This is not the first time that the Ensuring Patient Access to Healthcare Records Act has been introduced. None of the previous versions of the bill have made it to the floor and have attracted considerable criticism. In his Healthcare Blog, Adrian Gropper, MD expressed concern over a previous version of the bill (Senate bill S.3530). The post New Bill Aims to Change HIPAA Rules for Healthcare Clearinghouses appeared first on HIPAA Journal. The Senate is to vote on a national data breach notification bill – the Data Security and Breach Notification Act – that aims to standardize breach notification requirements across all states. Currently there is a patchwork of data breach notification laws across the United States, each with different reporting requirements. If passed, the Data Security and Breach Notification Act would replace state laws. While there is a clear need for national standards to ensure all consumers are equally protected regardless of where they live, all previous attempts to introduce nationwide standards for data breach notifications have failed. The Data Security and Breach Notification Act was introduced by Sen. Bill Nelson (D-FL), with the bill co-sponsored by Sen. Richard Blumenthal (D-CT) and Sen. Tammy Baldwin (D-WI). Sen. Nelson first introduced the bill in 2015, and introduced a revised version a year later, both of which failed. Announcing the bill, Nelson highlighted the recent Uber data breach, which saw the names, phone numbers, and email addresses of more than 57 million customers and the names and driver’s license details of 600,000 U.S drivers exposed. Uber became aware of the breach in 2016, negotiated with the hackers and paid them $100,000 to destroy the stolen data, and attempted to coverup the breach. Details of the breach were only recently made public. Following the announcement of the Uber breach, the massive Equifax breach, and other major breaches that have resulted in considerable harm to U.S. consumers, it is hoped that this time around the bill will progress. If passed, the Data Security and Breach Notification Act would require notifications of data breaches to be issued to state authorities and breach victims within 30 days of the discovery of a breach. The breach reporting requirements of the Data Security and Breach Notification Act are tougher than those in most states, as are the penalties for concealing a data breach. Executives of companies that knowingly conceal and fail to report a data breach would face up to five years in jail. Financial institutions covered by, and in compliance with, the Gramm-Leach-Bliley Act will be deemed to be in compliance with the Data Security and Breach Notification Act, as will organizations that comply with Section 13401 of the Health Information Technology for Economic and Clinical Health (HITECH) Act, or 1173(d) 19 of title XI, part C of the Social Security Act, with respect to data covered by section 13401 of the HITECH Act or the HIPAA Security Rule. The bill also calls for the Federal Trade Commission (FTC) to develop a new set of security standards that business can follow to help prevent data breaches. The post Data Security and Breach Notification Act Introduced in Senate appeared first on HIPAA Journal. The post Lawsuits Filed for Alleged HIPAA and HITECH Act Violations appeared first on HIPAA Journal. An essential part of HIPAA compliance is reducing mobile device security risks to a reasonable and acceptable level. As healthcare organizations turn to mobiles devices such as laptop computers, mobile phones, and tablets to improve efficiency and productivity, many are introducing risks that could all too easily result in a data breach and the exposure of protected health information (PHI). As the breach reports submitted to the HHS’ Office for Civil Rights show, mobile devices are commonly involved in data breaches. Between January 2015 and the end of October 2017, 71 breaches have been reported to OCR that have involved mobile devices such as laptops, smartphones, tablets, and portable storage devices. Those breaches have resulted in the exposure of 1,303,760 patients and plan member records. 17 of those breaches have resulted in the exposure of more than 10,000 records, with the largest breach exposing 697,800 records. The majority of those breaches could have easily been avoided. The Health Insurance Portability and Accountability Act (HIPAA) Security Rule does not demand encryption for mobile devices, yet such a security measure could have prevented a high percentage of the 71 data breaches reported to OCR. When a mobile device containing ePHI is lost or stolen, the HIPAA Breach Notification Rule requires the breach to be reported and notifications to be sent to affected individuals. If PHI has been encrypted and a device containing ePHI is lost or stolen, notifications need not be sent as it would not be a HIPAA data breach. A breach report and patient notifications are only required for breaches of unencrypted PHI, unless the key to decrypt data is also obtained. Even though HIPAA does not demand the use of encryption, it must be considered. If the decision is taken not to encrypt data, the decision must be documented and an alternative safeguard – or safeguards – must be employed to ensure the confidentiality, integrity, and availability of ePHI. That alternative safeguard(s) must provide a level of protection equivalent to encryption. Before the decision about whether or not to encrypt data can be made, HIPAA covered entities must conduct an organization-wide risk analysis, which must include all mobile devices. All risks associated with the use of mobile devices must be assessed and mitigated – see 45 C.F.R. § 164.308(a)(1)(ii)(A)–(B). In its October 2017 Cybersecurity Newsletter, OCR reminded covered entities of the risks associated with mobile devices that are used to create, receive, maintain, or transmit ePHI. HIPAA covered entities were reminded of the need to conduct an organization-wide risk assessment and develop a risk management plan to address all mobile device security risks identified during the risk analysis and reduce them to an appropriate and acceptable level. While many covered entities allow the use of mobile devices, some prohibit the use of those devices to create, receive, maintain, or transmit ePHI. OCR reminds covered entities that if such a policy exists, it must be communicated to all staff and the policy must be enforced. When mobile devices can be used to create, receive, maintain, or transmit ePHI, appropriate safeguards must be implemented to reduce risks to an appropriate and acceptable level. While loss or theft of mobile devices is an obvious risk, OCR draws attention to other risks associated with the devices, such as using them to access or send ePHI over unsecured Wi-Fi networks, viewing ePHI stored in the cloud, or accessing or sharing ePHI via file sharing services. OCR also remined covered entities to ensure default settings on the devices are changed and how healthcare employees must be informed of mobile device security risks, taught best practices, and the correct way to uses the device to access, store, and transmit ePHI. OCR offers the following advice to covered entities address mobile security risks and keep ePHI secure at all times. To access OCR’s guidance – Click here. Implement policies and procedures regarding the use of mobile devices in the work place – especially when used to create, receive, maintain, or transmit ePHI. The failure to address mobile device security risks could result in a data breach and a penalty for noncompliance with HIPAA Rules. Over the past few years there have been several settlements reached between OCR and HIPAA covered entities for the failure to address mobile device security risks. The post Tips for Reducing Mobile Device Security Risks appeared first on HIPAA Journal.